It is Wednesday and once again the Rose City T-girls are going out to dinner, tonight we are going to Rock Bottom. We have gone here many times over the years and always treated wonderful, last time we were here was December 6th. Now our dinners start at 7 but I always try to get there a little early, to get a table and also incase one of our newer members show up early as it is sometimes hard to be the first one if you are new to going out. As always I started getting ready as soon as I got home about 4:45. Now I know some may wonder why I so enjoy getting ready and doing my makeup and I always use to say it was because I was still new to doing this but that is not so much the case any more as this is my 1,135th blog and that mean I have gone out that many times and there were times early on when I would dress mostly at home or late night drives and not blog about it. 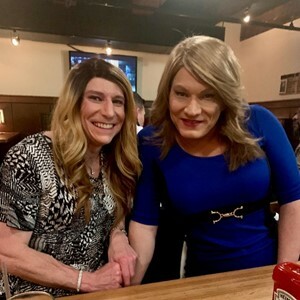 It really is hard to believe how many times I have gone out, as 20 years ago I could not even imagine going out at Susan. Any way I took my time and it was a little after 6 when I was ready to leave. I got downtown Portland and in all the time I have come here I have never found a spot on the street so I was heading straight to the parking garage just a block away. I was at the red light, first car and when the light turned green several people stepped out in front of me going against the light, now as a driver this is frustrating so you can only imagine what I was thinking as I waited wondering if the light would turn before they cleared and I could go. Well as I turned my head watching them, I saw a car just 4 spots up on the street pull out so now I am thinking what luck. I was finally able to go and turned and parked on the street. Turned out this worked out better for me as it was a little closer and would only cost me .60 to park tonight. I walked the block to the Rock Bottom and yes it was cold about 36 out and will be freezing by the time we leave tonight. I went in and they were not really busy. The young man at the desk asked if I had reservations and I said no but we would have 6 to 8 as I had 5 post they would be here and 1 maybe. He said not a problem they could set a table up for us. I told him that was great but it would be about 7 when everyone was here. I sat down in the waiting area for others to show up and for him to get our table ready. It was only about 5 minutes and Melissa showed up so we talked a few minutes till our table was ready. In some ways it still amazes me how comfortable I am now when I go out although I do miss the excitement I use to feel when I went out. The young man came and showed up to our table. It wasn’t long and Robin showed up and shortly after Lauri and Barb so we had 5 of us here by 7. We waited just a little before ordering just in case the one girl who posted as a maybe showed up. We all talked as we waited. It was about 7:20 when we decided to order. Our waitress took our orders, I of course ordered the Chicken Fried Chicken. It is really good, if you like chicken you must try this if you come here. Now it was nice to talk with all my friends and I got to talk with Robin a little more as she was sitting right next to me. She had been out all day as Robin and actually just got back in town. She did a professionally photo shoot as Robin on her trip and she had some awesome pictures of her. We of course got a picture of us also tonight. Our dinner came and we had a nice dinner and wonderful conversations. I really do like these dinners as they are easier to talk and get to know each other. 6 to 8 is a good number as it is a small enough group where you can really interact with everyone easily. I am torn on this as it is such a great event to socialize that I wish more girls would come but then again you would loose that intimate group feeling but either way this really is a wonderful event. After dinner we sat and talked for a while. I just enjoy being out so much with my friends I really don’t want it to end even though I know it has to as I get up really early for work. It was after 9 when we called it a night and we were one of the last groups there other then some people sitting at the bar. Now we talked about dinner next week and decided not to do one as Valentines day is on Thursday but in two weeks we will once again get together for dinner. We said our goodbyes out side and Barb went one way, Robin another and Melissa, Lauri and I walked together for a block before we all went our own way. It really is a wonderful feeling to be able to be out like this. Thanks for reading and be sure to see what is new on my newest blog. I love it when you are able to include photos of the girls who come to an event as it helps me learn the names and faces. Looking forward to coming out again with you and the group later this month.